Here's a list of great things online, many of them pointed out to me by friends and readers; I’ll update as I get them together. If you’re in need of some funky fresh lyrics to put you in the spirit check out eight fantastic old school hip hop video. It would be unfair to Daniel Craig and Clive Owen to enter Scottish rugby player Sean Lamont into their little competition; follow the link to see him from the front and do make sure your boss isn’t standing behind you. Always a good idea to assume our links are NSFW as that’s just how we roll here at meerkat. Thanks to omg. Pete Wentz interviews Robert Smith and they discuss South Park. Entertainment Weekly did it but Stereogum extracts the meaty pulp. In a neat coincidence Esquire's music critic Andy Lager’s weekly podcast features lullaby versions of Cure songs. 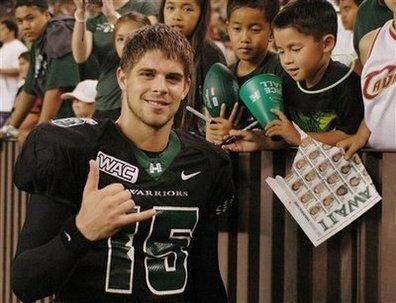 Colt Brennan, U of HI star quarterback. I have really got to start getting into ESPN2. Thanks to Kenneth in the 212. 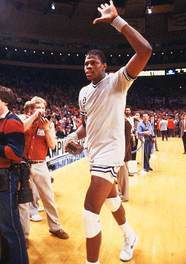 Sports Illustrated is featuring a tribute to college sports style innovators like Patrick Ewing here who’s singled out for his fresh take on the kneepad. I personally would have singled out the Wilt Chamberlain style old-school short shorts. All the cues these fashion hall of fame boys deliver are pretty good: the High Socks, the Half Shirt (super naughty), the Tattoo Pads and the Angry Kicker.